The proposed "Brooklyn Behemoth" office tower (+ condos/retail) at Site 5 of the Atlantic Yards/Pacific Park project, currently home to P.C. Richards and Modell's, would be created by moving the bulk planned for the B1 tower over the arena/plaza and adding it to the already substantial building planned there. In other words, a building some 511 feet and 1.1 million square feet would be added to one 250 feet and 439.050 square feet. That would make a giant building, perhaps the tallest and bulkiest largest tower in Brooklyn. So, what happens when you have Atlantic Yards/Pacific Park construction, Barclays Center operations, and an active fire station in a very tight perimeter? Something has to give, and the larger neighborhood becomes a staging arena. It's not uncommon. These videos from Thursday 2/25/16 show a food delivery truck that was dislodged from the Barclays Center loading dock, apparently, when a fire department response took precedence. The food truck then moved down Dean Street just past Sixth Avenue, opposite a site formerly occupied by row houses and set to be a 27-story tower with school, to continue unloading. Except that blocked the fire truck from returning to the station, and the traffic behind it. I'm told the situation persisted for considerably longer than shown in the videos. Oh, the circus is back in Brooklyn, and it has to be fun, right? Last chance to see Ringling Bros. elephants before they retire to Florida, the New York Post reporter tells us, enlisting his kid for a review. A New York Daily News reporter joins Ringling Bros. and Barnum & Bailey circus pros, talented stunt dogs at Barclays Center--yes, another stunt. Unlike in past years, when they've used the "pad" outside the loading dock on Dean Street on the south end of the arena, now they're using temporarily closed public streets behind construction fencing (aka MTP, or Maintenance and Protection of Traffic) on Atlantic Avenue, previously the site of construction cranes. See the videos below, and note that the first shows them using a generator. How is this permitted? And why was it not announced to the public? According to the latest Atlantic Yards/Pacific Park Construction Alert (bottom), issued Friday (appropriate lead time) for the two weeks beginning Monday, February 29, after-hours sewer connection work will occur along Dean Street near Sixth Avenue starting Monday. That's for the B3 (38 Sixth Avenue) site at the southeast corner of the arena block. All work will be done after 6:30 pm, but no end time was specified in the alert, which was distributed by Empire State Development, the state authority overseeing/shepherding the project, after preparation by Greenland Forest City Partners. Nor was there any information about noise or impact on traffic or pedestrians. The process should take about two weeks. Saturday work may continue at B2 (461 Dean Street), B3, and B14 (535 Carlton). There could be weeknight work at B14 until 9 pm. Also, there will be weekend work in the Long Island Rail Road tunnel and rail yard. Hours were not reported. Other new work is reported verbatim below. With attendance flagging, the NBA team will cut ticket prices by an average of 24 percent for the 2016-17 season, according to a person with direct knowledge of the matter. The discounts will apply to season tickets for some but not all of the best locations at Barclays Center. Front-row seats are not going on sale, nor are the $3,500-per-game Hollywood Seats, between the bench and the scorer’s table. Floor seats on the baseline and seats in rows B through D, which cost as much as $1,450 per game this season, will be reduced a blended 11 percent. The arena’s more affordable seats will get bigger discounts. That latter number is not disclosed, but remember, the cheap seats are often much, much cheapter on the secondary market. On the secondary market, tickets for the next two games start at $10 and $9, though the lowest face value (I believe) is $25. Well, despite the many monitors said to be at the Atlantic Yards/Pacific Park site, it's hardly clear they're present on weekends, and even if they were, they certainly didn't see or stop this jackhammering at 8:30 this morning. As noted in the caption, it seems to violate the Second Amended Memorandum of Environmental Commitments, signed by the developer, as detailed below. The 2016 City & State Power 100 has more than a few people linked to the Atlantic Yards/Pacific Park project, and while I'm not going to detail the obvious (Governor Andrew Cuomo, Mayor Bill de Blasio), I wanted to highlight a few, and note how de Blasio's Deputy Mayor Mayor Alicia Glen is said to run his housing plan. Don’t take our word for it – just listen to what government watchdogs said last year when NY1 did extensive reporting on the consulting firm’s close relationship with the de Blasio administration. Those watchdogs like to use BerlinRosen as an example of a system they view as flawed, which just adds weight to the argument that the growing firm is having a clear impact on the policy decisions being made in the city. BerlinRosen offers the Atlantic Yards/Pacific Park developers a key link to City Hall. The big news at Wednesday night's Atlantic Yards/Pacific Park Community Update meeting concerned developer Greenland Forest City Partners' plans for two huge office towers. It touched on several other issues, including safety at Times Plaza, a perpetually out-of-service escalator at the arena plaza, a dangerous intersection at Vanderbilt Avenue and Dean Street, and mold issues at the B2 modular site. But an underlying theme, popping up several times, relates to accountability and the inability to get it from the developer and the state authority overseeing/shepherding the project, Empire State Development (ESD). Though there are some signs of progress, success remains elusive, as noted for example in this Instagram post after the meeting. More than a few citizens and journalists are asking about the 2005 Atlantic Yards Community Benefits Agreement (CBA), so let's recall some history about the document long touted as a model but now seen as a "borderline calamity." First note my update, which describes how four of the extant seven groups (one the eight already closed, as noted below) are essentially inactive, with some initiatives accomplished, others pursued but with question marks, and others vague or ignored. But it was flawed from the start. 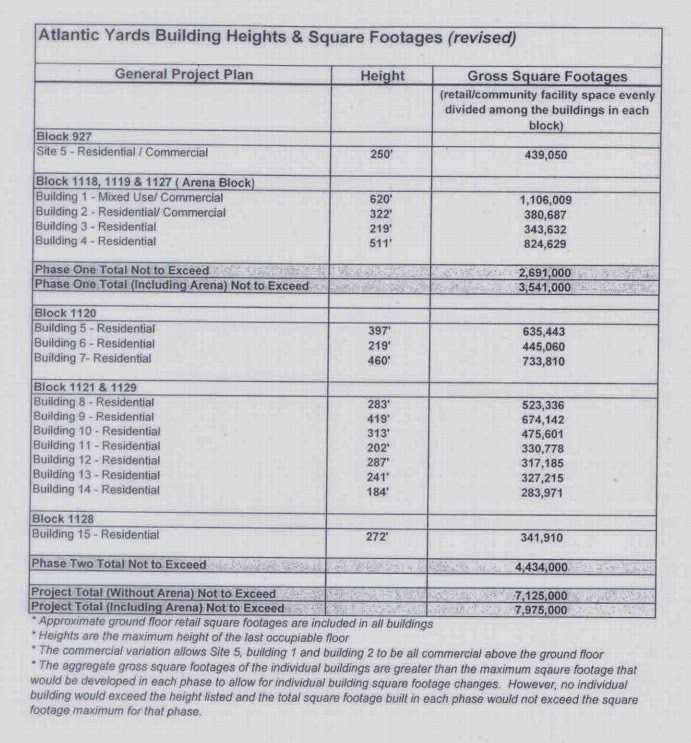 No, there were no renderings of the "Brooklyn Behemoth"--the potential 1.5-million square foot tower-at last night's Atlantic Yards/Pacific Park Community Update meeting, which generated both muttered ("terrible") and muted criticism about its preposterous scale. Nor was there a timetable, concrete information, or chagrin at the notion of moving the entire 1.1 million square footage approved for the 511-foot B1 tower over the arena--thus preserving the plaza crucial to arena activities and appreciated by neighbors compared to the alternative--and adding it to the already substantial 439,050 square feet approved for Site 5. That's currently home to P.C. Richard and Modell's--a site the New York City Planning Commission called for reduced height to 250 feet, given its adjacency to low-rise neighborhood. So, is the intersection of Vanderbilt Avenue and Dean Street--where extended construction fencing causes southbound traffic to veer somewhat and is believed by some to have contributed to several crashes--too dangerous? At tonight's Atlantic Yards Community Update meeting, Abigail Ikner of the Department of Transportation reported that DOT's Office of Construction Mitigation and Coordination reviewed the location as well as the traffic control devices. The visibility allowed, she said, goes beyond the required standard, and the crashes were blamed on factors other than construction. They won't move the fence, she said, "we are continuing to look at that location." Greenland Forest City Partners is expected to pull back the fence somewhat around that construction site, 550 Vanderbilt, toward the end of spring, but residents remained dismayed. As more construction emerges at the Atlantic Yards/Pacific Park site, there will be additional encroachments on the street and sidewalks, and new MPT (maintenance and protection of traffic) will be needed. At tonight's Atlantic Yards Community Update meeting, Leroy Branch of the New York City Department of Transportation said the new MPT will be unveiled either at the next Community Update meeting, in April, or at a special meeting before then. He added that community concerns regarding a planned public space upgrade at Times Plaza--residents said safety first--"resonated with us... We're going to come back to the community with a safety plan in and around the area, as well as Times Plaza... It's not just going to look at the plaza... we definitely heard you." So, when will the Down escalator at Barclays Center plaza be fixed? No firm date. At tonight's Atlantic Yards Community Update meeting, Wayne Bailey, president of the 78th Precinct Community Council, noted that many people have complained about the Down escalator not working on the Barclays Center plaza. "The Down escalator has been out of service on and off for a few months now," responded arena spokesman Terence Kelly. "After repeated Band-Aid fixes, turning it on and off, the malfunction required a mechanical fix.... The quote on the [needed] part is being discussed and being negotiated right now.. I don't have an update on what the time will be. I know it's very frustrating. We'll make a better effort to keep you informed." He said he hoped to have better news in two months at the next Community Update meeting. The nonfunctioning escalator doesn't just frustrate community residents, Kelly added. "On a business operations end, it's not something that appeals to the guest experience." At tonight's Atlantic Yards Community Update meeting, Forest City Ratner spokeswoman Ashley Cotton was asked if there was a mold issue in the in-construction modular apartment building, 461 Dean Street, known as B2. "No," responded Cotton. "Water happens in construction sites all the time. I know people keep pointing to it again and again. We have insurance for these sorts of things. Any mold that would pop up on this building or any other building, whether it’s modular or not, gets ripped out and remediated and taken care of. Any incidences of mold that that have popped up at B2, 461 Dean, have been taken care of." Well, maybe, though evidence has not been made public about how lingering questions about mold were addressed, as noted below. The rendering has been created by taking the bulk of 511-foot, 824,629-square foot B4, inflating it by about 30%, and plopping it on top of the 250-foot, 439,050-square foot Site 5, to approximate 1.5 million square feet. So the building would likely be at least 900 feet tall. This is adapted from an image in the 2006 Final Environmental Impact Statement, which is why there's titanium on the arena. Needless to say, this is very unofficial. See more on the proposed building here. In a discussion today, the CEO of Forest City Realty Trust (formerly Forest City Enterprises), parent of Forest City Ratner, seemed curiously underinformed about the plans floated for a massive office tower--which I've dubbed the "Brooklyn Behemoth"--for the one-acre plot, known as Site 5, currently occupied by Modell's and P.C. Richard. But he may have made an admission about the somewhat reduced bulk that could constitute Forest City's fallback position. Remember, Site 5 has been approved for a 250-foot, 439,050-square foot tower, while B1 has been slated to be 511-foot (reduced from the approved 620 feet), 1,106,009-square foot tower. Update: a rather opaque agenda was released at 3:36 pm. There's an Atlantic Yards/Pacific Park Community Update meeting tonight at 6 pm at 55 Hanson Place, where, according to a message from Empire State Development (the state authority overseeing/shepherding the project) on behalf of itself and developer Greenland Forest City Partners "We will present an overview of the upcoming construction activities surrounding the project." That's opaque, and it's insufficient on a number of grounds. First, the meeting, which a state official has called a "developer meeting," was formerly a "Quality of Life Committee" meeting, in which community members and groups helped shape the agenda. More recently it has been used as part of a developer public relations strategy to unveil information--first placed with friendly media outlets--about the open space and the B15 tower and school.